l have several different microphones. Which one I use depends on what I’m recording my video with and where I’m recording it. Recently, I have been recording video primarily with my iPhone 7 Plus, but I do, occasionally, still use either my Olympus OM-D E-M5 II or E-M1 I. For the most part for my Video Update episodes I use my Røde SmartLav+ lavalier mic plugged directly into my iPhone 7 Plus. The only additional cable I have to use is the Apple 3.5mm-to-Lightning adapter. If, however, I'm going to be further than the length of the SmartLav+ cable - about 2.5’ or 3/4 meter - away from the iPhone then I have to use one of two or three options. I can use the SmartLav+ mic plugged into my small Olympus WS-852 audio recorder using the Røde SC3 TRRS-to-TRS adapter cable, or I can use my Audio-Technica ATR-3350 Lav mic which has a 20’ (6 meters) long cable and connect it using the Røde SC7 TRS-to-TRRS adapter to my iPhone. Recently, though, I purchased a PowerDeWise lav mic to test out for use in a filmmaking camp I do in the summer. 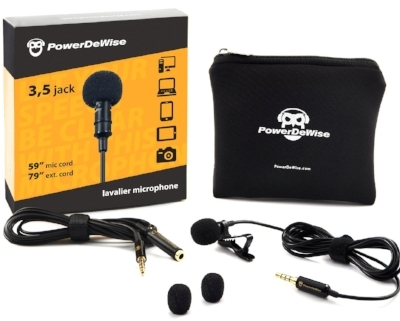 Like the SmartLav+, the PowerDeWise mic comes with a 3.5mm plug on a 5’ cable (or 1.5 meters) that is for use with smartphones that have the TRRS configuration. And, again, I must use my 3.5mm-to-Lightning adapter with it on my iPhone 7 Plus. However, unlike the SmartLav+, this PowerDeWise mic comes with a 79” or 2 meter extension cord, so I can use it as far as about 11.5 feet or 3.5 meters away from the iPhone. Recording to the Olympus recorder does mean I have to sync the audio with the video recorded on the iPhone, but it has the advantage of not being encumbered by a cable. I can also attach my Røde VideoMicro directly to my iPhone but, frankly, I think I would only use that setup if I were interviewing someone or I had to have my iPhone too far away from me to use the SmartLav+ mic and wanted to pick up up more ambient sound. I do use the VideoMicro as a boom mic hanging close over my head if I can and don't want to be bothered with a Lav mic. I have done an entire Photography & Technology Tools episode on the VideoMicro mic. I haven't used my Saramonic Wireless mic for some time. In fact, I haven’t used it since I bought the Røde SmartLav+ to use either with my iPhone or the little Olympus recorder. After watching an excellent video on microphone options by Jason van Genderen, an Australian who started Filmbreakers (http://mobilemoviemaking.com/man-behind-filmbreaker-movement/), however, I think I need to dig out my Saramonic and try it again and see if my model will work with the VideoMicro mic attached. As I recall the Saramonic model I have (SR-WM4C) is still good and handy to have, but using these other choices produces cleaner audio, in my opinion.